Welcome to the latest post from the Science Geek. This post is about the effect the Moon has on the Earth and is a part of a series of posts about the Moon to celebrate the 45th anniversary of the first manned Moon landings. I hope you enjoy reading it and as always please feel free to leave me any comments. I also would like to thank Mrs Geek, without whose valuable input the content of these posts would be much poorer. 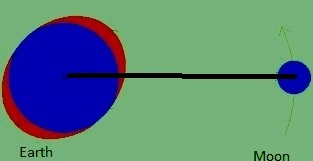 A tidal bulge also occurs in the area of the Earth facing directly away from the moon, shown as B in the diagram. Taken together these two tidal bulges cause a high tide to occur every 12.5 hours, which is the time interval between when the moon is highest and lowest in the sky. The Earth rotates on its axis in around 24 hours, whereas the Moon takes 27.5 days to complete an orbit of the Earth. Because the Earth rotates on its axis faster than the Moon revolves around the Earth, the tidal bulge is always a little bit ahead of the moon. This is shown in the diagram below. This causes two separate effects: one on the Moon and one on the Earth. (1) The pull of the tidal bulge ahead of the Moon causes the Moon to accelerate very slightly. In effect, it pulls the Moon along, causing it to spiral away from the Earth into a slightly higher orbit. (2) The pull of the Moon on the tidal bulge slows down the Earth’s rotation, causing the days to quite literally get longer. How Fast is the Moon Moving Away from the Earth? The Moon has an oval-shaped (elliptical) orbit around the Earth, so its distance varies. On average it is roughly 385 000 km away from the Earth. Experimental equipment left on the Moon by the Apollo astronauts has confirmed that the average distance from the Earth to the Moon is increasing by about 4 cm a year. How Close Has the Moon been to the Earth ? Because the Moon is slowly getting further from the Earth, in the distant past the Moon was much closer to the Earth. In fact, when the Moon was first formed, about 4.5 billion years ago, it was around 22 500 km away from Earth, i.e. roughly one seventeenth its current distance. At this distance it would have appeared to be 17 times larger in diameter, or nearly 300 times bigger in area than it does now. If there had been anyone around to see it, it would have made a truly impressive sight. Its effect on the Earth would have been enormous, causing tides that were hundreds of metres high. The full moon would have been about 300 times brighter than the full moon is today, so during a full moon it would have been barely dark at all! The day is the most natural unit of time, splitting up time into chunks measured by the rising and setting of the Sun, but how long is a day measured by the rising and setting of the sun? 24 hours? Not quite. It is now very slightly longer than this. In the year 1900 a mean solar day (the term astronomers use for a day measured by the rising and setting of the Sun) was almost exactly 24 hours. However analysis of astronomical observation over the last few hundred years has shown that, due to tidal friction, the days are getting longer at a rate of 0.0017 seconds per century (see notes below). A day currently, in the early 21 st century, lasts around 24 hours 0.001 seconds. Because a “real day”, as measured by the Earth’s rotation, is slightly longer than 24 hours, every so often an an extra second or “leap second” needs to be added so that the time we keep lines up with real time measured by the Earth’s rotation and does not drift away. 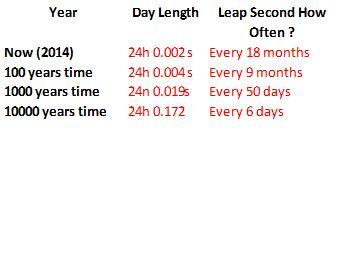 Leap Seconds are always added just before midnight on June 30 or December 31. Since their introduction in 1972 there have been 25 leap seconds. The last was on June 30 2012. In the future, as the Earth’s rotation continues to slow down, the days will continue to get longer. As this happens we will have to add leap seconds more often to ensure that the day that we use aligns with the “real” day measured by the Earth’s rotation. The table above shows the length of day and how often we will need to add a leap second to bring our clocks in line with the mean solar day. As you can see, assuming that humanity is still around, in 10000 years time we would have to add a leap second every six days. There is a way in which this could be prevented. Mankind might choose in the future to redefine how long a second lasts. We would then have a ‘new second’ which would be slightly longer than the second we currently use, 60 of these new seconds would make a ‘new minute’, and 60 new minutes would make a ‘new hour’. With these new units then a day would be exactly 24 hours again – but not quite the hours as we now know them. I hope you have enjoyed reading this post from the Science Geek. My next post in this series about the Moon will be about the manned landings on the Moon and I shall give my view on lunar exploration in the next few decades. Like most things in science, things are slightly more complicated than my explanation would suggest. If tidal friction were the only effect on the Earth’s rotation then it would slow down at a rate of 0.0023 seconds per century. However, the Earth’s rotation is erratic and events such a large earthquake can temporarily speed it up. Also, since the end of the last ice age the Earth has been changing shape to become less flattened at the poles. This causes a temporary speeding up of the Earth’s rotation of 0.0006 seconds per century, which is why we observe a slowing down of only 0.0017 seconds per century. I can see why there’s a bulge where the water is pulled by the moon’s gravitational pull but why is there a bulge at the other side of the earth? Thank you for your comment. At first sight it appears strange that we have two high tides per day and the second high tide occurs on the side of the Earth furthest away from the Moon. 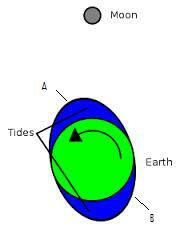 The reason for the second high tide on the side of the Earth facing away from the Moon is as follows. The gravitational field created by the Moon exerts a slightly stronger than average force on the side of the Earth facing the Moon, and a slightly weaker force on the opposite side. The Moon thus tends to “stretch” the Earth slightly along the line connecting the two bodies. This causes the two bulges: one in the side nearest the Moon, and one in the side furthest away.